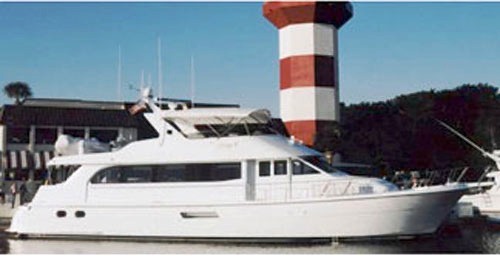 Crewed motor yacht LUCKY ME is a 75ft Hatteras built in 2000 and has been very well maintained since. 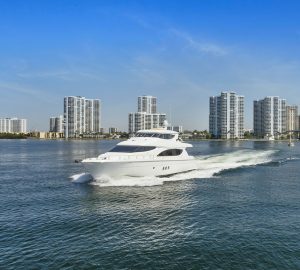 The yacht is based in New England during the summer months and the Bahamas during the Winter. 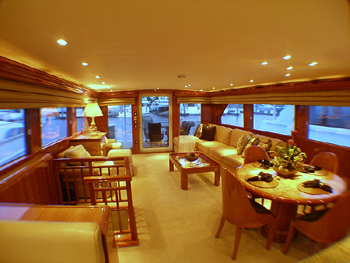 Motor yacht Lucky Me has a lovely bright yet warm interior with neutral soft furnishings. 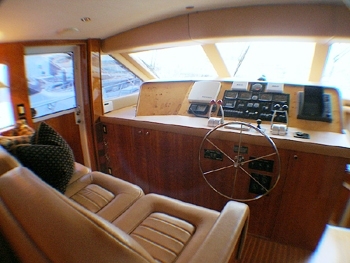 Her main saloon features a large TV, Direct Satellite Service, CD and VCR. 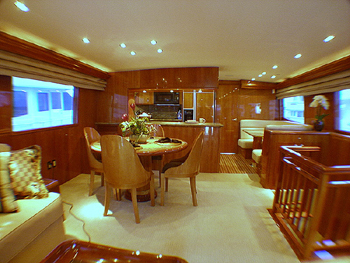 The adjoining dinning room with seating for 6 is found on the main level of the yacht. Downstairs there is accommodation for 6 guests in 3 double cabins. The large master stateroom is located aft and features a king size bed a cedar lined closet and a ‘his and hers’ marble bath room. There is a full entertainment system with Direct TV, CD, VCR player. 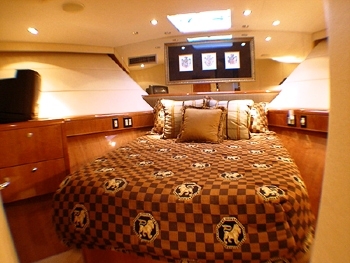 The VIP cabin located mid ship and the forward stateroom both feature a queen sized bed. On the aft deck is another table with seating for 6 guests which leads down to the swimming platform for easy access to the 18ft tender. On the fly bridge Lucky Me features a bar with stools, BBQ grill, and nice lounging areas. She has a great selection of watersport toys. Bahamas and New England based LUCKY ME has a great crew of two. Captain Carl receives great feedback from guests and is looking forward to welcoming you onboard! 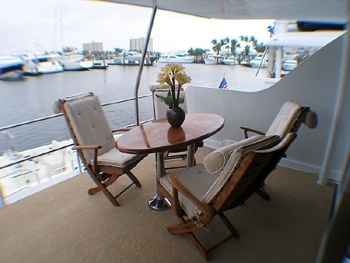 Motor yacht Lucky Me can accommodate 6 guests in 3 Double Cabins. The master stateroom is located aft and features a king size bed a cedar lined closet and a ‘his and hers’ marble bath room. There is a full entertainment system with Direct TV, CD, VCR player. 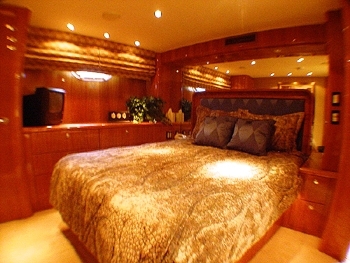 The VIP cabin is located mid ship and features a queen sized bed, full en-suite cabin with shower and bath, cedar lined closet and entertainment system with Direct TV, CD player and VCR. 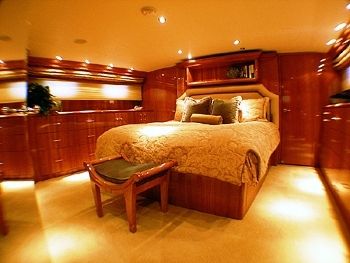 The forward stateroom features a queen sized bed full en-suite bath with shower and entertainment system. Lucky Me has a fly bridge which features a bar with stools, BBQ grill, and nice lounging areas. The main salon features a large TV, Direct Satalite Service, CD and VCR. 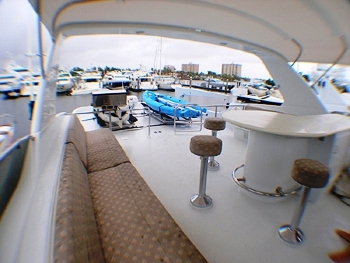 Lucky Me also offers the following tenders and toys: 18' towed tender, snorkel gear, light fishing gear, towable tube, wakeboard, 2 kayaks, small sailboat.